A complete selection of meeting chairs and conference seating solutions designed for commercial interiors. With over twenty years of experience in furniture consultancy, UK businesses rely on us to provide the very latest modern meeting seating solutions for their office meeting rooms and conference environments. Depending on the model, our meeting chairs can be used for various seating applications, from formal meeting and conference rooms to informal areas in open plan offices. You can select meeting chairs in various styles with wood backs, in either mesh back or in Black leather, high back, plastic or upholstery, as well as bases such as cantilever, four-legged and sled base seating. Some of our meeting chairs provide ergonomic lumbar support as well as chair bases on glides or castors for convenience and movement. Our executive meeting chairs offer high-end seated comfort with the finest materials such as genuine leather upholstery. Many of our multi-purpose meeting chairs are lightweight and stackable, offering efficient storage and facilitating easier distribution (especially useful for short-notice meetings). Our stackable conference chairs can be stacked up 20-25 chairs high from the floor, and up to 40-45 chairs high when placed into a transport dolly (depending on the model). Not only does this save valuable space, it provides a much easier way of moving and storing these lightweight meeting chairs. 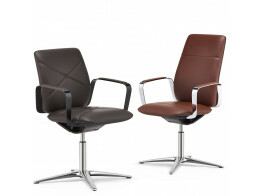 Office meeting chairs are perfect for boardroom meetings, events, as well as university settings. We can also provide guest and conference chairs with integrated tablet surfaces. This allows note-taking to be performed without the need for an additional table surface which is highly efficient; chairs designed with space and budget taken into account. Our meeting chairs are designed with multi-purpose environments in mind. We only source from Europe's leading manufacturers, so you can be certain you are receiving the highest quality and value for money. With so many designs to choose from we are confident you will find the right meeting and conference chairs for your company for one or more applications. 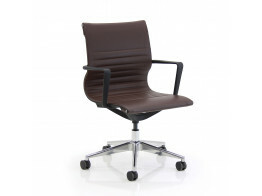 ConWork Conference Chair finds the optimum ergonomic seating position without any intervention by the user. 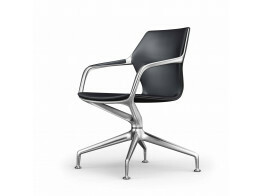 Ray Meeting Chair is an aluminium frame seating solution with seat tilt mechanism. 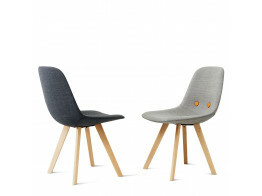 Eyes Wood Chair is an organic refreshing seating solution for dining and informal meeting areas. 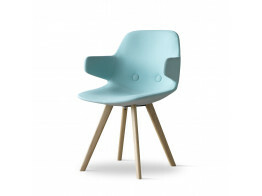 Flux Meeting Chair is a light swivel chair with height adjustment on castors. 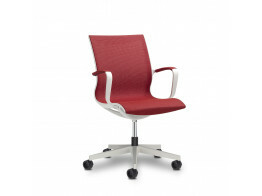 Soul Air Chair is a light office task chair and meeting seating solution with mesh seat and back. 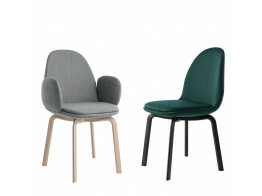 Eyes Armchair is a comfortable meeting chair solution with wooden oak legs. 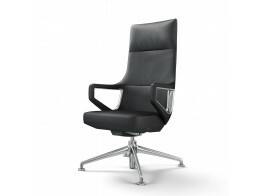 Fina Executive Chair can be used in top level conferences or executive offices.